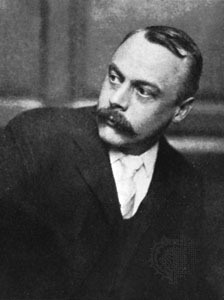 The Scottish author Kenneth Grahame (8 March 1859 – 6 July 1932) is best known for his endearing children's classic The Wind in the Willows (1908). He also wrote a clever twist on the legend of Saint George battling the dragon, titled The Reluctant Dragon (1898). Both have been the inspiration for several movie adaptations, beloved by children for many generations, featured in our Favorite Fairy Tales. Kenneth Grahame will always be dear to me for the role he played in my life while I was learning to read. I can still remember the sight of The Wind in the Willows perched upon the book shelf in my childhood home. I encountered it in that period of life where my mother was no longer reading stories out loud to me and I was reading to myself. While I could read simple books, the "big books" were out of my range. I would still grab The Wind in the Willows and leaf through it. I was drawn to the color illustrations and the lively characters; I particularly liked the idea toads and badgers could talk and that when nobody was looking they behaved just like people. The desire to learn what they were saying to each other was a burning motivation that drove me to read. I can still remember the cloth binding on that book and the discovery that though Mr. Toad loved to drive, he was, in fact, a terrible driver.